Cabinet/storage units with fretted doors and drawers in lacquered wood and with tempered glass. Structure in lacquered MDF wood, available in various colors. 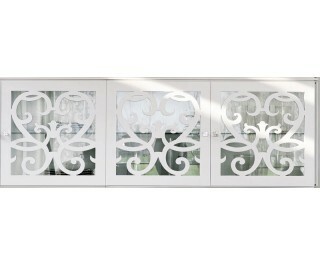 Perforated wooden door MDF with matt black painted tempered glass, champagne or extra-white. Blum hinges and drawer guides. Knobs with chrome + insert Swarovski.